Time: 2:00 p.m.- 3:30p.m. | 4:00 p.m.- 5:30 p.m. Ethical issues arise from the invention of biotechnology (such as genetic enhancement). There have also been perennial ethical problems (such as abortion and euthanasia). Through rigorous reasoning, bioethicists seeks to clarify and perhaps resolve these problems. 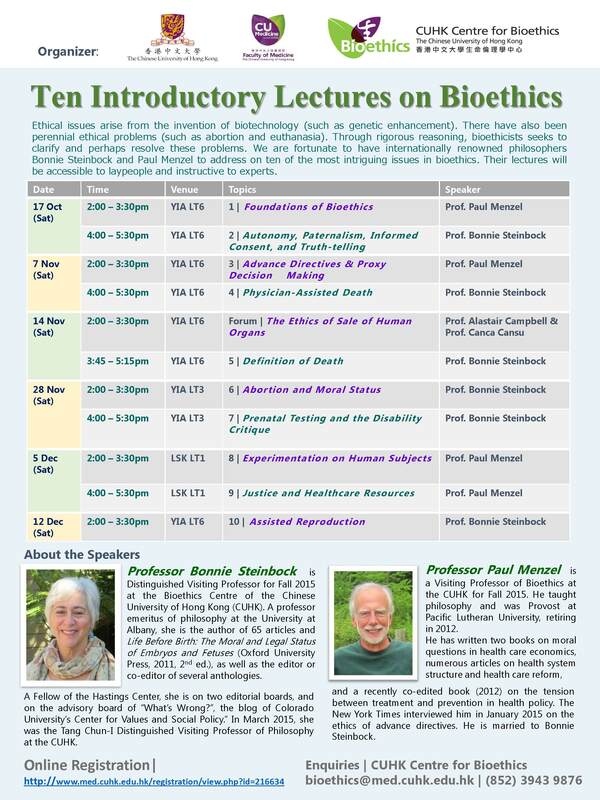 We are fortunate to have internationally renowned philosophers Bonnie Steinbock and Paul Menzel to address on ten of the most intriguing issues in bioethics. Their lectures will be accessible to laypeople and instructive to experts. 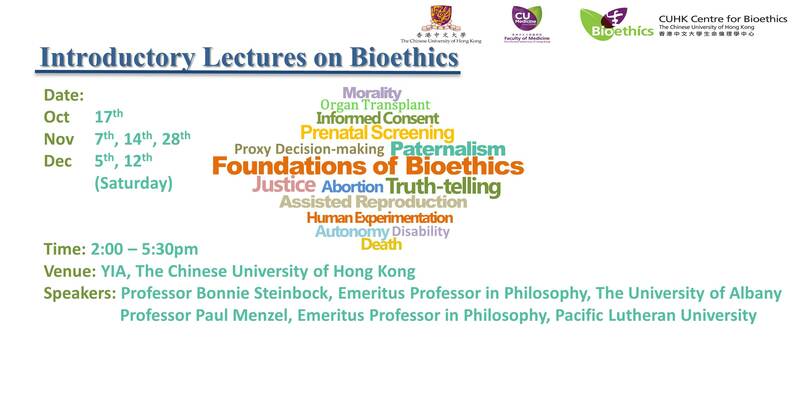 Professor Bonnie Steinbock is Distinguished Visiting Professor for Fall 2015 at the Bioethics Centre of the Chinese University of Hong Kong (CUHK). A professor emeritus of philosophy at the University at Albany, she is the author of 65 articles and Life Before Birth: The Moral and Legal Status of Embryos and Fetuses (Oxford University Press, 2011, 2nd ed. ), as well as the editor or co-editor of several anthologies. A Fellow of the Hastings Center, she is on two editorial boards, and on the advisory board of “What’s Wrong?”, the blog of Colorado University’s Center for Values and Social Policy.” In March 2015, she was the Tang Chun-I Distinguished Visiting Professor of Philosophy at the CUHK. Professor Paul Menzel is a Visiting Professor of Bioethics at the CUHK for Fall 2015. He taught philosophy and was Provost at Pacific Lutheran University, retiring in 2012. He has written two books on moral questions in health care economics, numerous articles on health system structure and health care reform, and a recently co-edited book (2012) on the tension between treatment and prevention in health policy. The New York Times interviewed him in January 2015 on the ethics of advance directives. He is married to Bonnie Steinbock. Presentation slides by Prof. Paul Menzel "Foundations of Bioethics"
Presentation slides by Prof. Bonnie Steinbock "Fundamental Concepts in Bioethics"